A head-to-toe matching look has always been your personal mission when it comes to style. You haven't picked out an outfit for the day yet, (or should we say 'OOTD') but when you do, by golly it WILL match. Now there's a way to even coordinate an ensemble with your hair for a look that can only be described as 'on point.' Don't worry, it doesn't involve endless boxes of store-bought dye or expensive appointments with a stylist either. Take this long wavy wig, your emerald leather moto pants (your fav), and the new fierce jade blazer hanging in your closet to create an arresting look bound to make onlookers green with jealousy. Styled as a trendy black to green ombre shade, this wig is comparable to the funky hairstyles currently seen on popular celebrities and social media influencers. 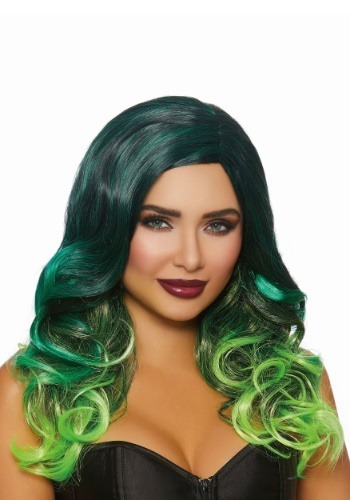 Featuring an adjustable wig cap to comfortably fit all women, this accessory displays synthetic strands of hair cascading from a dark black to a vibrant lime green with some teal pieces mixed in here and there. There are so many costumes that correlate with this wild wig. Use it to enhance any witch, Medusa, or female Joker costume. Of course, this wig always looks great with your emerald moto pants. By the way, where did you get those?